The construction of Yogastudio De Weerribben has finally been completed! Its start was in autumn 2016. The result exceeds all our expectations. Some have already been able to enjoy this small scale yoga accommodation surrounded by nature. Yet one task remains to be done: its official opening. Which is truly appropriate for a place like this. We are delighted that Kundalini Yoga teacher Gurumarka Singh Khalsa has accepted our invitation to come to Yogastudio de Weerribben from 19-24 March, 2019. 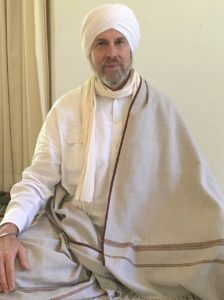 He is offering a beautiful Kundalini Yoga program, with various thematic workshops, healing- and coaching sessions and an introduction Kundalini Yoga workshop. He has a 45+ years of experience as coach and spiritual teacher. His workshops are described as relaxing and challenging, to-the-point and confrontational, humorous and entertaining. Gurumarka is a member of IKYTA and teaches according to the standards of KRI. Yogastudio de Weerribben is situated in the heart of ‘National Park Weerribben-Wieden’ and thus cannot be reached by car. One gets here by boat, bicycle or walking, which provides an instant holiday feeling in itself. You are picked up from the parking place for a boat ride through the nature of ‘de Weerribben’ and your daily pace will have slowed down already on arrival. Every workshop focuses on a different theme. You can attend just one or you can combine them. When taking part in two or three workshop days you will sleep at ‘de Imme’, our adjoining group accommodation. The beautiful nature, magical silence and inspiring workshops will bring you the experience of being on a small retreat. You will be recharged and relaxed at the same time. We serve vegetarian meals which are prepared from fresh organic grown ingredients and any dietary wishes will of course be reckoned with. During these healing and coaching sessions, participants work on physical, emotional, relationship, prosperity and spiritual issues. A session may include guidance, nutrition, meditation, kriya, and other healing techniques. Both for individuals and for couples. Families are also welcome to ask for advice. Date: March 19 and 20. Duration: 30-40 minutes. Language: English. Costs. Kundalini Yoga is a dynamic yoga which pays much attention to postures (asana’s), physical exercise, breathing techniques (pranayam), mudras, mantras and meditation. Kundalini Yoga works directly on the human glandular and nervous system. Consequently, exercises have an immediate effect on your physical well-being in terms of increased relaxation and vitality. Everyone is welcome to participate regardless of experience, leniency or age. Date: March 21 7 PM – 9 PM. Language: English. Participants: 10. Costs. The thematic workshops can be attended separately or in combination. Because the groups are small, one enjoys a personal attention rarely found in larger groups. Each workshop is unique and includes meditations, kriyas, and other processes based on the science of Kundalini Yoga as taught by Yogi Bhajan. When following two or three workshopdays you are welcome to participate in the early morning sadhana. Open to everyone who is interested, both beginners and experienced. Date: March 22 10 AM – 17 PM. Language: English. Participants: 10. Costs. Our intuition is the direct link to the unlimited potential of our soul. Intuition is also called the neutral mind or meditative mind. This workshop will feature special meditations to expand your intuitive abilities. These include greater trust of yourself, making better decisions, and the courage to face life’s challenges. Open to everyone who is interested, both beginners and experienced. Date: March 23 10 AM – 17 PM. Language: English. Participants: 10. Costs. The workshop on March 23 is full. Mail yogastudio@weerribben.eu to be placed on the waiting list. Doesn’t everyone want to be healthy? The immune system is the connecting point for five of your body systems. It is the link to better health. You will learn which foods, exercises, meditations, and activities best increase the power of your immune system. Can you imagine a life without colds, flue or serious disease? Open to everyone who is interested, both beginners and experienced. Date: March 24 10 AM – 17 PM. Language: English. Participants: 10. Costs. extra costs privat room € 20 per day. Reductions for early birds are valid up to and including Januari 31, 2019. In case you want to register for more than one event we ask you to make a registration for each event separately. In such cases we will contact you for the arrangement of accommodation and/or meals. The workshops are held in De Imme in the Weerribben. De Imme is located in the heart of National Park Weerribben-Wieden and thus cannot be reached by car. One gets here by boat, bicycle or walking. For those who arrive by car, we have a parking place at Kalenberg and a free ferry service (10 minutes boat ride). Carpooling is useful for people who do not have cars. Inform us when signing up for the workshop(s) you travel. When using public transport, w’ll arrange it so that one of the other participants will pick you up at station Steenwijk. For detailed information about the access to the location, also when you want to reach us on foot, by bike or by boat, please consult our itinerary. For detailed information, call +31(0)612618904 (Marjo) / +31(0)21286789 (Wim) or send an email to yogastudio@weerribben.eu.